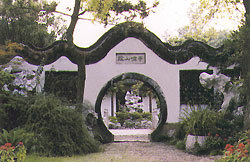 The Heyuan Garden at 77 Xuningmen Street in south Yangzhou is also known as "Jixiao Mountain Villa" Built during the Guangxi Reign of the Qing Dynasty, it is one of the well-known later-day gardens. Covering a limited space of 0.7 hectare, the garden is special in that around its pool sits a variety of pavilions that are linked together to form an architectural belt 430 meters in length. A stroll around the pond along the winding corridor brings the visitor to every conceivable corner of the garden, which falls in two parts. 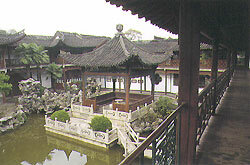 The eastern part is the site of the Boat Hall and the Peony Hall. North of the Boat Hall stands a building with an exotic name, "Phoenix Facing the Sun", where female guests were feasted. Theatrical performances were staged in a kiosk that stands in the center of a fish-shaped pool for the entertainment of theatre goers who were seated in a winding corridor. The Butterfly Hall, the main hall of the garden, was where men were feasted. Ancient trees tower over the entire garden. which is a world of artificial mountains, with rocks of exotic images gazing longingly at each other and flowers in blossom in all four seasons.